It is interesting how you get around to using the same products after a few years of gap. I had reviewed the Garnier 3 in 1 face wash a few years ago and then recently tested it out again. You can check the previous review HERE. Let's see what happened to this product in these years, good and bad. The packaging has changed to a more sleeker, flatter tube as the previous one was big and chubby, improvement. The artwork has also changed slightly but the main variant is same. Formula, apparently, is upgraded. Even though I thought I saw micro beads it's claimed to be Volcanic rocks and Pumice. Microbeads is not mentioned in the ingredients as well so that is definitely a good upgrade (hoping). The formula is thick and creamy with scrub like texture. It smells very fresh like mint and eucalyptus. Applies lightly and washes off easily as well. It works as a face wash for cleansing, an exfoliating light scrub and a refreshing mask. The product claims to unglog pores, remove dead skin and blackheads, removes excess sebum and protect against the appearance of spots. Good for everyday use. My previous experience was good though I changed many face washes in between after that. When I recently got back to trying it I was once again not disappointed. I have combination to oily skin which tends to get dry patches in winter. I used this during the dryer months and it did not over dry my skin though I still recommend you tone and moisturize nonetheless. I used it as a cleanser, scrub as well as mask. It has a slight tingly, cool feeling when you apply and I love the smell. The scrub is gentle on my skin and didn't irritate neither did I experience any redness. I usually don't get a lot of blackheads now as I am have improved my skin care routine but it definitely exfoliates and leaves your skin feeling clean, refreshed and pores minimized. So far I have been very happy using this product and will continue using this as one of my facial cleansers. I would suggest people with sensitive and dry skin to test it out as it can dry out their skin but it's really good for Oily and Combination skin. 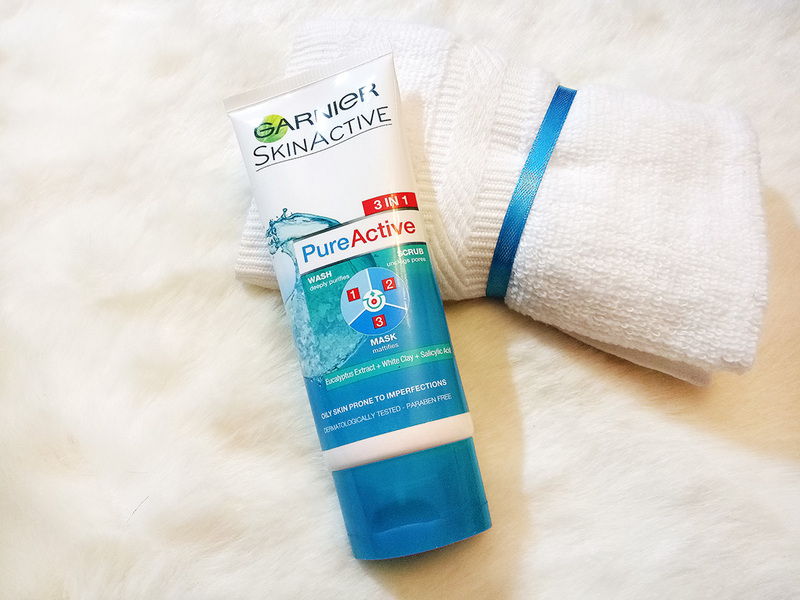 The GARNIER pure active 3 in 1 Cleanser is easily available in most stores but you can also get it online from just4girlspk as well. The price for the small tube is Rs. 149/- and the big tube is for Rs. 650/-.